* This doll is sold out elsewhere - but we still have some stock!!! Tanya is a 52cm/20" all vinyl doll for play. 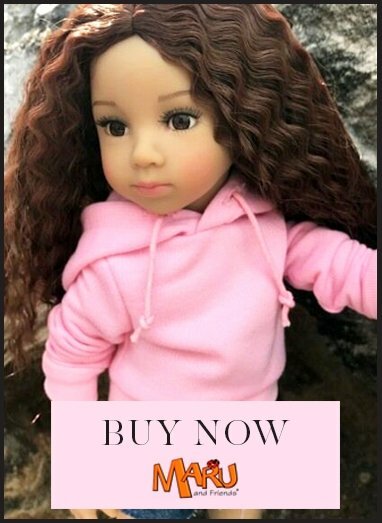 Magnificently crafted with unique, child‑like facial features that look just like a little girl. She may look and feel like porcelain, but she is made from the finest materials for durable play. Tanya™ is a gorgeous brunette with soft curly hair that is easy to style and comb. Tanya has light brown vinyl skin tone, between white and brown and her heritage is referred to as African-American. Her light brown eyes and angelic beauty will take your breath away. She styles an all turquoise cable knit set, ribbed leggings and black boots! A fashionable outfit for any occasion. Sculpted by master doll artist, Dianna Effner. Certificate of authenticity included. Tanya is safety tested for children from age 3 but we recommend her to girls age 6 and above as her body is vinyl which makes her less cuddly than a soft bodied doll, therefore usually better for a slightly older girl. Her wigged hair requires a bit more care in the way it is handled than rooted hair does. Maru & Friends dolls are very high quality play dolls, desired by collectors too.